Our country is still in a state of stupor, a state of sadness and remorse. Much lives were taken and so many have lost all their belongings, their houses and any form of ID they might have. Anyway, after five days of being unable to write, I finally felt that I still owe it to this blog and to its readers to update it. But going back to the groove of things does not mean I've forgotten the value of seeing how precious and vulnerable life is --- and being there for my fellow Filipinos.As I write this, Typhoon Parma/Pepeng is just 200 Nautical Miles away from Manila. Please do pray. Now, on to the review: I got this angled blush brush during my recent trip to KK. We were strolling at CenterPoint Mall [was it?] and I saw the Elianto stall. It was the first time I discovered that Elianto was not a Korean brand but rather a Malaysian brand. Inexpensive at 13 RM [approx. Php 169.00] I've forgotten how much this is here but I think it's more or less the same. Locally-available. Lots and lots of Elianto stores are now spotted in major malls especially SM and Ayala malls. Works well with my NARS Oasis, same with a revisited former HG blush, L'oreal Blush Delice in Rosy Cheeks. The brush bled the first time I washed it but did not bleed anymore the following washes, so yay! The softness can sometimes hinder the firmness that's why it may be hard to contour but this is forgivable. My friend and I bought the same brush but the quality was not the same. Apparently, my friend's brush was rough and not soft at all. I've read in GIRLTalk, too, that some have experienced this. Some have bought stuff, never checked and yet when they check their purchases at home, the brushes were either used or of low quality. Tsk. Overall, though, I have no problems with it. 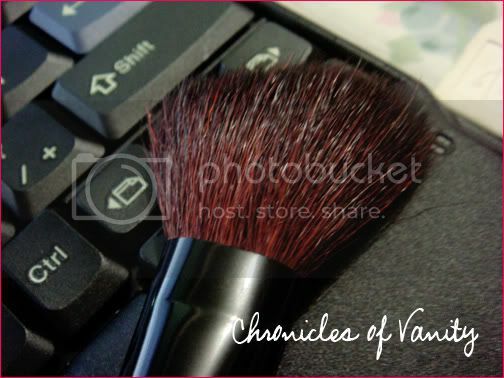 However, the next time I am in need of an angled blush brush, I'd like to try another brand. Hope this review helps! Mio Update: I emailed Frances of Topaz Horizon the other day to reserve an item from her book and bag sale. She replied that Mio is actually doing better! It was like a ray of sunshine amidst the bad news I've been reading about these days. See? God is soo good! Right now, we're all anxious because of the typhoon. I've heard all sorts of adjectives for Typhoon Pepeng, such as 'supertyphoon,' 'as strong as Hurricane Katrina' and lots more but I'm trusting and keeping my faith that God will be there and won't let us down. Please join me as I pray.